I am so thankful for the American patriots across our nation who voted this past November to bring Congress back to the ideals of our Founding Fathers. The White House and congress heard loud-and-clear that American’s don’t want cradle-to-grave government control of our lives. We don’t want government bureaucrats deciding what kind of light bulbs we should use, what kind of cars we should drive, and which doctors can and can’t care for us and our families. And we don’t want our president continuing to manipulate the U.S. energy supply. What we want are the freedom and opportunities to make a better life for ourselves in this most exceptional nation on earth. Taking back control of the House last year was only the first step, [donor’s name]. Now you and I must fix our eyes on 2012. Our goal is to take back the White House and the Senate. We must also take back control congress and the White House in order to undo the damage done by the disastrous Obama/Pelosi/Reid agenda. I’ll be supporting commonsense conservative candidates in crucial off-year elections and doing all that I can to ramp up our preparations for 2012. And, I promise to join you in holding new members of Congress accountable to ensure that the live up to their campaign promises to rein in out-of-control government spending and to repeal and replace the massive, burdensome, and unwanted Obamacare bill. Can count on your support as we look ahead to 2012? 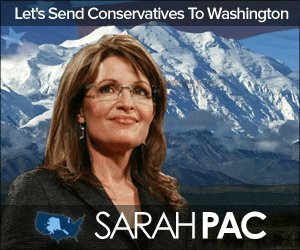 I know what a sacred trust it is to be asking you to contribute your hard-earned money to SarahPAC. I take that trust very seriously, especially in these hard economic times. Bust there’s so much at stake now – we are the most powerful country on earth and the world is better off because of us. Yet our own president and his liberal Senate seem determined to weaken us. It’s imperative that you and fight to end deficit spending…protect our free market entrepreneurial system…drill here and drill now for responsible energy independence…secure our borders…and strengthen out national defense to stand up to Islamic extremists and other enemies of America. If you want to help me lay the crucial groundwork, plese use the enclose reply form to send your best gift possible to SarahPAC today, [donor’s name]. Thank you for joining me in the fight to keep America the country we know and love! Paid for by SarahPAC. Not authorized by any candidate or candidate’s committee. It’s been up since Friday night, but it is open until midnight on April 22nd. You can vote here. There is a question for your first choice and for your second. Note to Internet Explorer users, for some reason it isn’t loading properly. It has been tested using Firefox, Google Chrome, and Safari though. I’m at a loss as to what the problem is (other than IE is a crappy web browser). Shane Vander Hart is the editor of Caffeinated Thoughts. Feel free to follow him on Twitter or friend him on Facebook. He’d love to connect.